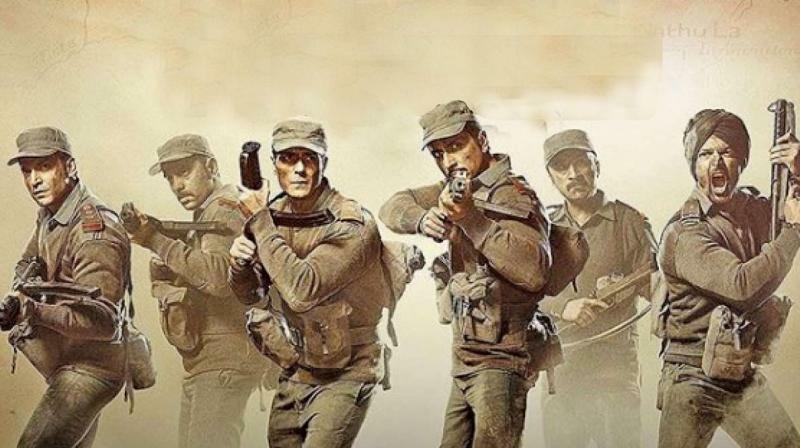 Paltan movie review: All roar and thunder but no film! We all know that producer director J.P. Dutta is a diehard desh bhakt and could give us lessons in warfare in history ad nauseam. To be fair, his multi-star cast films — Border and LoC: Kargil — that had many top Bollywood A listers managed a decent run at the box office, particularly the former. But must he script a 154-minute film, the contents of which are not chronicled anywhere in the recorded account of any documentation of the Indian Army? In his earlier two films, the motivation for glorifying India’s splendour and success came from bashing our infamous neighbour. This time, the attention shifts and centres around another one of India’s staunch enemies — China. As Dutta comes up with yet another war saga — on the war between India and China — he tries to play it safe by taking us back to the 1962 attack by China that somewhat is the grist to the war that flowed. Wandering a bit on the 1965 war that also serves more as a passing mention, he jumps to the 1967 tale based on the 1967 Nathu La and Cho La clashes along the Sikkim border after 1962 Sino-Indian War. Starring an ensemble cast with Jackie Shroff, Arjun Rampal, Sonu Sood, Harshvardhan Rane, Esha Gupta, Sonal Chauhan and many more, the film barely manages to keep your interest alive throughout as all the actors show enough lung power to roar beyond their capacity, at times. Dutta, who like Manoj Kumar, has a mission, it seems — of inspiring the youth to a world of profound passion through his films — continues to be a lone ranger in this regard. Finding an appropriate milieu of a battlefield where violent confrontations between members of two armies lead to a merciless conflict fought by two warring nations, Dutta apprises us of his fundamental aspects of reality. He prides himself on the premise that it is the ultimate expression of patriotism that makes or ruins a nation. But, the third part of the war trilogy, never takes off, really. In between several combatant characters, all of whom talk menacingly justifying their masculine approach to their premium jobs, a skirmish between some Chinese and Indian soldiers leads to a terrible warfare. The trouble with Paltan is not the story; one would love to delve deeper into historical facts and make an attempt to know more of our heroic warriors who sacrificed their lives for our country. My spending more than two hours on a film would have been well spent had there been a film. With grenades, rifles, references to no-man’s land, real issues that entail wars, and, of course, belligerent Armymen dominating through the run time, the film never seems engaging. What is also amusing to see are Chinese men who are made to look like poor souls wanting in not just courage, but also lacking in grey matter. It’s the Indians who always have the upper hand and make mincemeat of competition — be it in a war of words or in the battlefield!